Delicious and moist glazed orange bread. 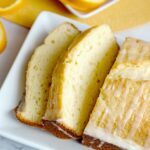 Citrus and bread go so well together, you'll absolutely love this recipe! Preheat oven to 350 degrees. Prepare a 9x5 loaf pan with non-stick spray. In a large bowl, add the sour cream, sugar, eggs, zest, vanilla, and oil and whisk until combined. Add in the flour and mix until well combined. In a saucepan, add the sugar and orange juice then heat until boiling. Let the mixture boil for a minute or two, until the sugar is dissolved. Remove from heat. Remove the loaf from its pan and place onto a cooling rack with wax paper underneath, pour the orange syrup all over the top and let it soak in. Once the bread is completely cooled, mix together the orange juice, powdered sugar, and extract. Drizzle the icing all over the top.